1. 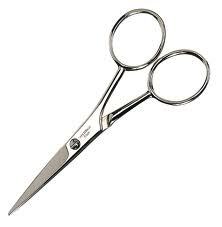 Bent-Handled Shears-7 to 8 inch long scissors suitable for cutting fabric because the blades rest flat on the cutting surface. 2. Trimming Scissors- 6 inch long scissors used for trimming and clipping seams and for general use. 4. 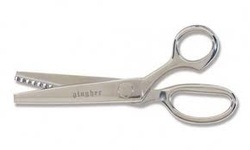 Pinking Shears- cuts a zigzag edge and is used for finishing hem edges, seams, etc. It should not be used for cutting out a garment b'coz it will not give an accurate cut line of the fabric. 5. Seam Ripper- a handy little tool for taking out seams and removing stitches. It must be used carefully so as not to cut the fabric. 6. 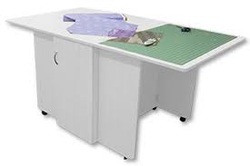 Cutting Board/Table- a flat board placed on a table where the fabric is laid out and cut. The fabric can be pinned securely to the cutting board/table to prevent it from slipping. 1. 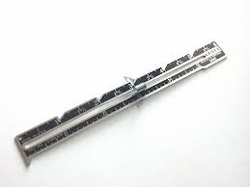 Sewing Gauge- a 6 inch gauge with a movable indicator convenient for measuring short lengths. 2. 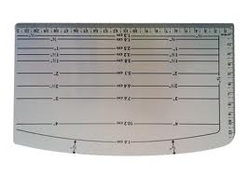 Hem Gauge- a measuring device marked with various depths and hemline folds. It is practical when hemming straight on grain edges. 3. 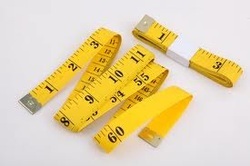 Tape Measure-a 60 inch lng measuring device used in taking body measurements, drafting patterns, and measuring fabrics. 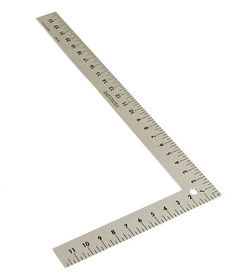 It has a metal tip and reversible markings in centimeters and inches. 4. 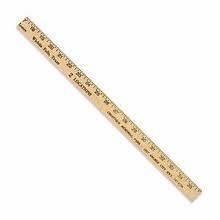 Yardstick/Meterstick- is use to measure fabric and to check grain line. It can be used in marking a long straight lines and in measuring hem lengths. The Hip Curve is used in connecting or shaping slightly curve points.It has a measure of inches at the front and centimeters at the back part. L-square - It is useful in constructing perpendicular lines with divisional parts located in longer and shorter arms. 1. Beeswax/Candle- makes the thread stronger and serves as lubricant, which makes the thread easier to use in sewing buttons and other hand sewing jobs. 2. Pin Cushion- a cotton-stuffed cloth cut and sewn in many different shapes to keep the pins in place. It will help you work conveniently when placed on your waist. 3. 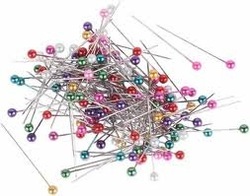 Pins- used when cutting and sewing material. Helps save time in basting. Dull-pointed and rusted pins should not be used b'coz they will destroy the fabric. 4. 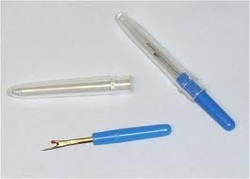 Needles- comes in three sizes: small, medium and large. Small needles are used on light and soft material, while big needles are for rough, thick and heavy materials. Needles are used for basting, sewing buttons on and when mending torn clothes. 5. Thimble- made of either plastic or metal material w/c is used to protect the finger from being pricked by the needle when sewing. A fitted thimble will help you sew comfortably especially when you are not used in sewing with a thimble on your finger. 6. Emery Bag- used for thrusting needles and pins. They sharpens the needles ad removes rust. 8. Sewing Box- serves as a utility box. Sewing tools like pins, thread, thimbles, and others can be kept in this box. Sewing boxes vary in style, such as the compartmentalized and non-compartmentalized box. A compartmentalized sewing box is practical b'coz ur tools can always be orderly arranged. 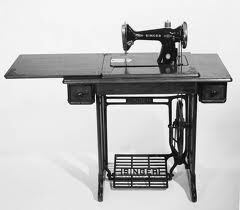 Sewing Machine - It is a machine used to stitch fabric and other materials together with thread. Tailor's Chalk - A thin piece of hard chalk used in tailoring for making temporary alteration marks on clothing. A tracing wheel is an instrument with multiple teeth on a wheel attached to a handle. The teeth can be either serrated or smooth. It is used to transfer markings from patterns onto fabric with or without tracing paper, this sewing tool also makes slotted perforations. Such markings might include pleats, darts, buttonholes, notches or placement linesfor appliques or pockets. Dressmaker's carbon paper - the functions is like a carbon paper. It is available in different colors, used with tracing wheel. 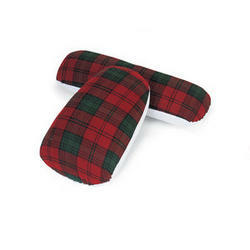 Flat Iron - is the small appliance used to remove wrinkles from fabric. 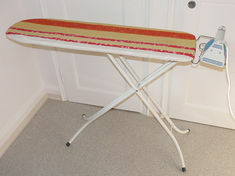 An ironing board - is a small, portable, foldable table with a heat resistant surface. A tailor's ham or dressmakers ham is a tightly stuffed pillow in the shape of a ham used as a mold when pressing curves such as sleeves or collars.